Unlike most other references on the market, this next-generation resource goes well beyond Bluetooth specifications and thoroughly examines different implementation approaches - as taught by a "master instructor." 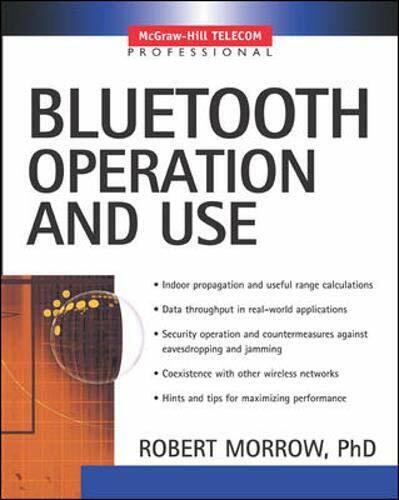 This book discusses Bluetooth in detail, covering both operational characteristics as well as its use as a wireless communications system. It addresses the coexistence of Bluetooth with other wireless networks and provides information on the significant security problems that exist when communicating without wires. It is based on 2 very popular and highly effective courses the author has been teaching for more than a year. Dr. Robert Morrow is the President of Morrow Technical Services and the creator of two of the leading Bluetooth courses in the wireless industry. He has given tutorials on Bluetooth, 802.11, and RFID at numerous conferences, contributes frequently to trade journals and periodicals, and received a patent on a spread spectrum communication system. Dr. Morrow is a retired Air Force pilot and professor living in Centerville, IN, where he enjoys amateur astronomy.